One of the trickiest tasks was to find the right foundation fabric this time. A little alteration of the color, and this one was perfect. I arranged the panels on it to measure for size and placement. I cut the foundation several inches bigger than needed, and also cut a piece of batting to go beneath it. Once I was sure of the placement of the panels, I trimmed each along with the batting and pinned them into place. 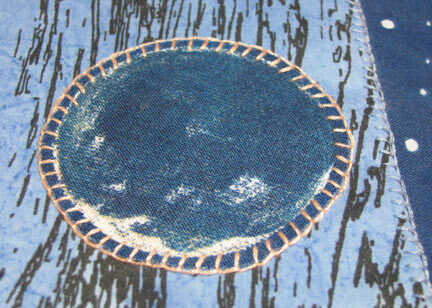 Although usually I would probably stitch the moons down first, working from the top downward, I wasn't 100% sure of the placement of the moons, so I stitched the panels down first, using a blanket stitch. 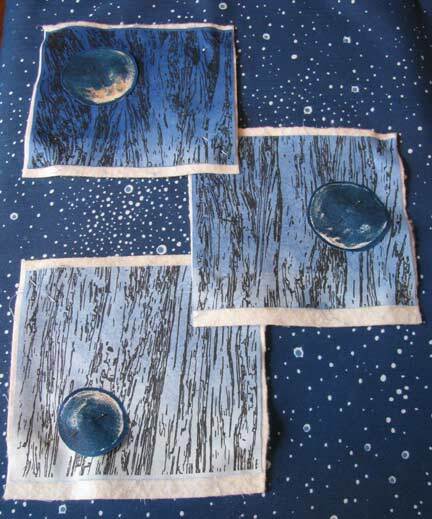 Ok, I rotated and moved the moons until I was satisfied, and then blanket stitched them down (not stitching through all the layers) with a contrasting thread. 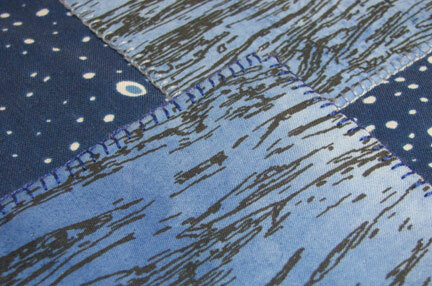 Thats exactly the sort of backing fabric im looking for too! I"m loving the step by step on here, Cyndi. It's great to see it come together and is looking so cool. I can't wait to see the final version. 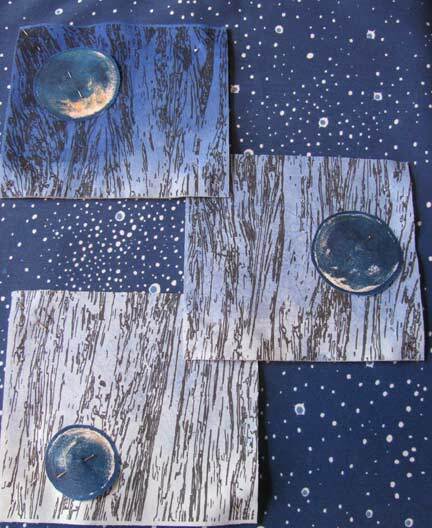 How did you create the moons, Cyndi? It looks like denim that you painted with bleach or something. It's very effective. They really look cool. I love the fabric choices on this.